This beautiful Reutter Porcelain dollhouse miniature Christmas Decorations Set is a 1/12th scale miniature set of holiday accessories expertly crafted by Reutter Porcelain. Hand painted German craftsmanship from Reutter Porcelain. In the new Christmas Decorations Set you will receive one wreath and one box of ornaments which can be removed from the box. 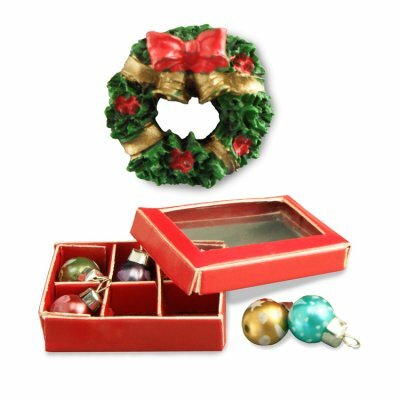 This Christmas Decorations Set is supplied by Reutter Porcelain, which generally ships within 1 business day(s) of you placing your order .